What compels suspicion? Is it some mysterious quality emanating from objects, or a dynamic projected onto them by the paranoid mind? If the latter is true, then this fact of mental derangement deserves scrutiny. Is it biogenetic, or a predictable response to a flaw of social organization? Wherefrom the urge to prematurely formulate reality in its most deadly configuration? It is, after all, an urge: spontaneous, demanding, deaf to reason. From the reaction, one may discover the source. Do these suspicious packages tend to pop up where people gather, or do packages become suspicious only in public? You are a home owner and a package appears on your doorstep: not suspicious. You rent an apartment and a package appears in the shared vestibule: slightly curious. You are fumbling with the door to a transportable toilet and bang your foot on a package: suspicious. The further removed one becomes from one’s private property, the further one’s sense of suspicion regarding objects becomes. The effect reaches its greatest pitch in large public gatherings—in shared space. It’s as if we have a reason to mistrust each other. But is this simple human nature or an effect of an insidious economic structure? People gather in places for holiday celebrations or government subsidized entertainment. What force is it we feel drawing the noose tight? Indeed, what crime is it to leave a “non explosive package” in public? Is it a symptom of our incapacity for thinking and behaving freely and peacefully together? Is it an anxiety produced within a public sphere which doesn’t believe in its own viability? Some will argue we have every right to be suspicious in a world where a van full of explosives has recently crashed into a crowd of people. Yet, the argument’s force wanes where proof against it—probability—falters. While we are in public, we are still immersed in the material logic of personal ownership, unable to be our full, open, social selves. The split registers as perceptual confusion, as fear. We are suspicious because we see—especially at a free event—the delineations of class which would otherwise separate us. They are unavoidable: some people look richer; some people look poorer. Some taking; some having been taken from. On either side of the equation, the only available response is suspicion. Now then, there’s a shopping bag with a half-drunk bottle of Powerade. For sure, Powerade is poison which nonetheless raises no suspicion when purchased at 7/11, but now, out of its commodity element, sets in motion a magnificently disproportionate response from the State. The response, through reproduction and repetition, is rationalized until it becomes protocol. A sordid fantasy becomes reality. The petty booj press can only marvel stupidly at minutia—“that bomb suit weights [sic] over 80 lbs”—thereby normalizing it as routine. Most notable in the June 17 incident is the reluctance of the authorities to describe the object. They insist that their coyness is tactical—‘the criminal mastermind behind the package may gain the upper hand if he knows what we know!’—but to reveal the ordinary nature of the package would be to dispel its power over us. They know that their response is little more than an opportunity to justify their useless purchases (‘you see we do need these baroque outfits and weapons in order to maintain public order!’) because they sense the fragility of their position in the community. The endemic paranoia of the police force cannot be overstated or excused. The well-documented militarization of the police is not thinkable without the occasional threat. Nothing happens. What is the afterlife of these threats in the social imagination? 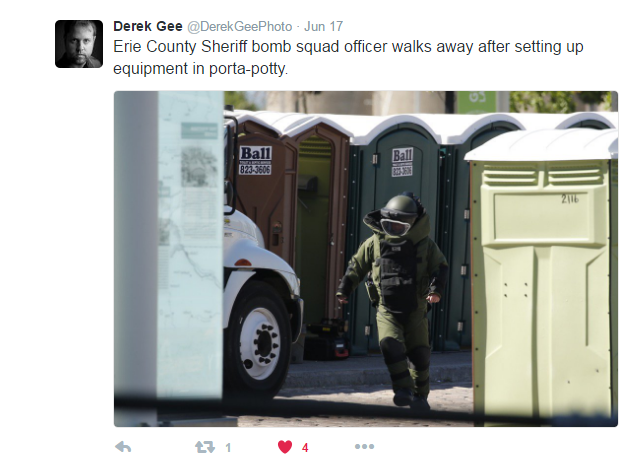 The man in the bomb suit is the mirror image of how we’d look if we pursued the doctrine of absolute security: if safety is paramount, and one can never be too safe, then he represents our ideal condition: a padded technician, entering a porta-toilet, and with assistance from a robot, neutralizing an imagined threat. The contradiction in our thinking—that the man in the bomb suit, despite his training, steely gaze and equipment, is still endangered—is to be avoided. Resolving this contradiction would mean admitting that we can’t be safe—and that saying “one can never be too safe” means a total loss of freedom. Those who insist on a delicate legal balance find themselves on eroding soil. Politically, the situation leaves us with little hope. We are caught up in a paradox: the man on the right, in whose mind the nanny state exists to purge the world of its bootstrapping Robinson Crusoes, is the loudest trumpet in the law and order choir. If a bomb explodes in a public place, the free market advocate should argue for the privatization of the police force, bomb-resistant port-a-potties and pret-a-porter bombsuits; surely, he betrays his most cherished principles by arguing for more surveillance, more government funding, more welfare for weapons contractors. Sadly, your man on the left is of even less help. Burdened with his late liberalism, he can only argue for policing with “a human face” or some other such contradictio in adiectio. For instance, the alleged socialist, Francois Hollande, has responded to attacks in France by dropping (more) bombs on Syrians. 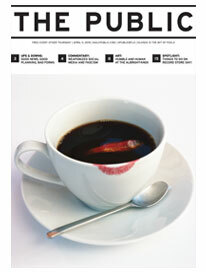 There’s no pretension of causality any longer. Meantime, the public sphere is cordoned off, presented to the public as a site of potential violence. The thought of what it means to gather with others is fraught with deadly premonitions. Such thinking however sometimes leads to the delightfully odd occurrence: e.g. people running for cover after mistaking fireworks for gunfire at a July 4 exposition. Two theses: An innocent person has no reason to feel suspicion; it is impossible to behave ethically in capitalism.